Ardley United won the UHLSport Supplementary Cup, beating Tuffley Rovers 2-0 in Saturday’s final with a brace from Leam Howards. The first half was fairly even, Jack Ross dragged a shot wide, Howards flashed an effort wide from distance before being denied by Rovers keeper Dave Evans from close range. 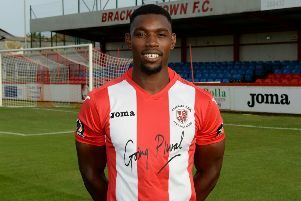 Bradley Cox’s header hit the bar and finally took a 43rd minute lead when Carl Tappin sent Howards away and he lifted the ball over Evans and inside the far post. Warren Mann curled an effort over and Jamie Goodwin fired wide but Howards notched his second goal a minute into added-time when Ross set him down the right again and he fired across Evans and inside the far post. The second half threatened to boil over, Tuffley’s Liam Wright was shown a straight red card for a foul on Luke Cray before Cox headed two corners narrowly wide and Howards fired over. A foul on Joel Meade resulted in a melee and the referee booked four players. With three minutes left Meade was shown a second yellow card for his reaction to a foul on Ross. Manager Paul Davis said: “I’m delighted to finish with a trophy, it’s a nice end for the players, staff and everyone connected to the club at the end of a long season. The boys have come a long way, to finish the season in fifth place and win a cup competition is a very nice feeling indeed. “I didn’t feel we started the game that well, we were prepared to face a battle but for the opening few minutes we didn’t seem to do that. For Leam Howards to finish the way he did really was tremendous and caps his season off really well.